Once upon a time, wine labels were boring, colorless (literally and in spirit), and the opposite of inviting. Now, many wine labels are fun. They catch your eye, draw you in for a closer look, and maybe make you smile. Although we tend to have classic tastes in wine, we love the variety of wine labels because it makes browsing for wine more enjoyable than ever. But wine labels have an important purpose besides making their bottles stand out on the shelves. Wine labels contain information about the wine that’s inside the bottle — and knowing what the information means can make you a smarter buyer. Sometimes that information is straightforward — like the name of the region where the grapes grew — and sometimes it’s tricky, like long phrases in a foreign language that you don’t speak. 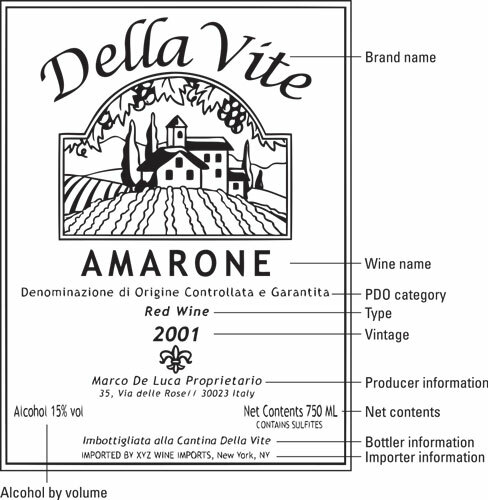 The following figure shows you how all the details come together on a label of an American varietal wine. Wines made outside the United States but sold within it must also carry the phrase imported by on their labels, along with the name and business location of the importer. The mandatory information required on U.S. and Canadian wine labels is also required by the E.U. authorities for most wines produced in European Union countries (although the wording of the warning label can vary). The labels of those E.U. wines must contain one additional item of information not required on labels of wines from elsewhere. This additional item is a phrase indicating that the wine comes from an officially recognized wine zone (see the next section for the scoop). The European Union has set up a system to recognize and protect agricultural products (such as wine, cheese, olives, hams, and so forth) that come from specific places so that companies in other places can’t make products with the same name and thus confuse consumers. Wines from all the classic wine regions of E.U. member countries (France, Italy, Spain, Germany, and so forth) are covered under this system. When you see the label of a European wine that’s from a recognized, protected place, you’ll find a phrase to that effect. Protected Designation of Origin (PDO), for the most regulated wines. The classic wines mentioned in the sidebar “Decoding common European place-names,” for example, are all in this category. But in practice, the situation is much more complicated, especially at the moment. How so? Second, because these E.U. designations went into full effect only in 2012, some wine labels still carry the phrases that were previously used by each country to designate a wine’s category of origin. If you’re getting into French, Italian, or other European wines and see a long, foreign phrase on the label that’s adjacent to the place-name or region of the wine, know that it indicates an officially protected geographic zone. If you really want to know which of the two protected categories the wine falls into, refer to the lists in the next two sections. This figure shows a European wine label as it would appear in the United States, using the original place-name terminology. Besides the mandatory information required by government authorities, all sorts of other words can appear on wine labels. These words include meaningless phrases intended to make you think that you’re getting a special quality wine, and words that provide useful information about what’s in the bottle. Sometimes the same word can fall into either category, depending on the label. This ambiguity occurs because some words that are strictly regulated in some producing countries aren’t regulated at all in others. 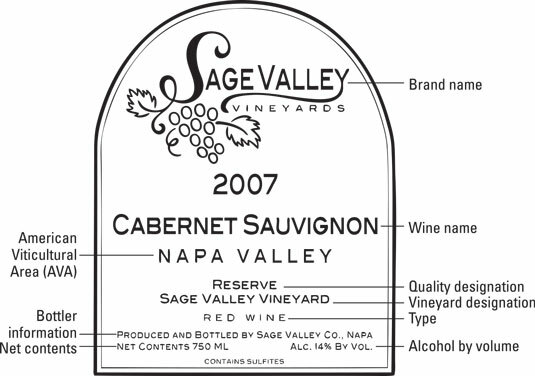 The word vintage followed by a year, or the year listed alone without the word vintage, is the most common optional item on a wine label (refer to Figure 4-2). Sometimes the vintage appears on the label itself, and sometimes it has its own small label closer to the neck of the bottle. The vintage year is nothing more than the year in which the grapes for a particular wine grew; the wine must have 75 to 100 percent of the grapes of this year, depending on the country of origin. (Non-vintage wines contain wines from more than one year.) But an aura surrounds vintage-dated wine causing many people to believe that any wine with a vintage date is by definition better than a wine without a vintage date. In fact, no correlation exists between the presence of a vintage date and the wine’s quality. Generally speaking, what vintage a wine is — that is, whether the grapes grew in a year with perfect weather or whether the grapes were meteorologically challenged — is an issue you need to consider (a) only when you buy top-quality wines, and (b) mainly when those wines come from parts of the world that experience significant variations in weather from year to year — such as many European wine regions. In Italy and Spain, the word reserve (or its foreign language equivalent, which looks something like reserve) indicates a wine that has received extra aging at the winery before release. Implicit in the extra aging is the idea that the wine was better than normal and, therefore, worthy of the extra aging. Spain even has degrees of reserve, such as Gran Reserva. In France, the use of reserve isn’t regulated. However, its use is generally consistent with the notion that the wine is better in quality than a given producer’s norm. In the United States, the word reserve has historically been used in the same sense — as in, Beaulieu Vineyards Georges de Latour Private Reserve, the best Cabernet that Beaulieu Vineyards makes. But these days, the word is bandied about so much that it no longer has meaning. For example, some California wines labeled Proprietor’s Reserve are the least expensive wines in a particular producer’s lineup and some of the least expensive wines, period. Other wines are labeled Special Reserve, Vintage Reserve, Vintner’s Reserve, or Reserve Selection — all utterly meaningless phrases. Estate is a genteel word for a wine farm, a combined grape-growing and winemaking operation. The words estate-bottled on a wine label indicate that the company that grew the grapes and made the wine also bottled the wine. In other words, estate-bottled suggests accountability from the vineyard to the winemaking through to the bottling. In many countries, the winery doesn’t necessarily have to own the vineyards, but it has to control the vineyards and perform the vineyard operations. Estate-bottling is an important concept to those who believe that you can’t make good wine unless the grapes are as good as they can possibly be. If we made wine, we’d sure want to control our own vineyards. We wouldn’t go so far as to say that great wines must be estate-bottled, though. Ravenswood Winery — to name just one example — makes some terrific wines from the grapes of small vineyards owned and operated by private landowners. And some large California landowners are quite serious about their vineyards but don’t make wine themselves; they sell their grapes to various wineries. None of those wines would be considered estate-bottled. Sometimes French wine labels carry the words domaine-bottled or château-bottled (or the phrase mis en bouteille au château/au domaine). The concept is the same as estate-bottled, with domaine and château being equivalent to the U.S. term estate. Some wines in the medium-to-expensive price category — costing about $25 or more — might carry on the label the name of the specific vineyard where the grapes for that wine grew. Sometimes one winery will make two or three different wines that are distinguishable only by the vineyard name on the label. Each wine is unique because the terroir of each vineyard is unique. These single vineyards might or might not be identified by the word vineyard next to the name of the vineyard. Italian wines, which are really into the single-vineyard game, will have vigneto or vigna on their labels next to the name of the single vineyard. Or they won’t. It’s optional. You’ll be pleased to know that we have just about exhausted our list of terms that you could find on a wine label. One additional expression on some French labels is Vieilles Vignes (vee-yay veen), which translates as “old vines,” and appears as such on some Californian and Australian labels. Because old vines produce a very small quantity of fruit compared to younger vines, the quality of their grapes and of the resulting wine is considered to be very good. The problem is the phrase is unregulated. Anyone can claim that his vines are old. The word superior can appear in French (Supérieure) or Italian (Superiore) as part of a PDO place-name. It traditionally meant that the wine attained a higher alcohol level than a non-superior version of the same wine would have — a distinction not worth losing sleep over. Now, the term is also used in Italy to designate a specific type of wine. Soave Superiore, for example, is a wine that’s distinct from the wine Soave by virtue of its vineyard location, winemaking, and so forth. The word Classico appears on the labels of some Italian PDO wines when the grapes come from the heartland of the named place.